According to the 1962 Missal of St. John XXIII the Extraordinary Form of the Roman Rite, today is the Vigil of St. John the Baptist. The Birth of St. John the Baptist is a solemnity, and so observance still begins with Evening Prayer I in the Liturgy of the Hours of the preceding day. The liturgical day is from midnight to midnight in the Church's observance, except for Sunday and solemnities which begin with the evening of the preceding day. 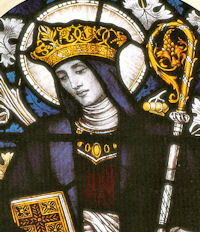 Historically today is also the feast of St. Ethelreda the most popular of Anglo-Saxon women saints. She lived in the early era of the Germanic invasion of Britain. Whom, my brethren, can we conceive to have such majestic and severe sanctity as the Holy Baptist? He had a privilege which reached near upon the prerogative of the Most Blessed Mother of God; for, if she was conceived without sin, at least without sin he was born. She was all-pure, all-holy, and sin had no part in her: but St. John was in the beginning of his existence a partaker of Adam's curse: he lay under God's wrath, deprived of that grace which Adam had received, and which is the life and strength of human nature. Yet as soon as Christ, his Lord and Savior, came to him, and Mary saluted his own mother, Elizabeth, forthwith the grace of God was given to him, and the original guilt was wiped away from his soul. And therefore it is that we celebrate the nativity of St. John; nothing unholy does the Church celebrate; not St. Peter's nor St. Paul's, nor St. Augustine's, nor St. Gregory's, nor St. Bernard's, nor St. Aloysius's, nor the nativity of any other Saint, however glorious, because they were all born in sin. She celebrates their conversions, their prerogatives, their martyrdoms, their deaths, their translations, but not their birth, because in no case was it holy. 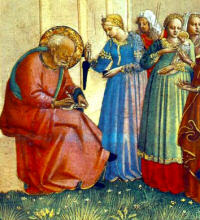 Three nativities alone does she commemorate, our Lord's, His Mother's, and lastly, St. John's. What a special gift was this, my brethren, separating the Baptist off, and distinguishing him from all prophets and preachers, who ever lived, however holy, except perhaps the prophet Jeremiah. And such as was his commencement, was the course of his life. He was carried away by the Spirit into the desert, and there he lived on the simplest fare, in the rudest clothing, in the caves of wild beasts, apart from men, for thirty years, leading a life of mortification and of meditation, till he was called to preach penance, to proclaim the Christ, and to baptize Him; and then having done his work, and having left no act of sin on record, he was laid aside as an instrument which had lost its use, and languished in prison, till he was suddenly cut off by the sword of the executioner. Sanctity is the one idea of him impressed upon us from first to last; a most marvelous Saint, a hermit from his childhood, then a preacher to a fallen people, and then a Martyr. Surely such a life fulfills the expectation, which the salutation of Mary raised concerning him before his birth. St. John's Birth marks the summer solstice. On the eve of this feast many countries have celebrated with bonfires. This is especially true in Ireland, Estonia, Latvia, and Lithuania. See the list of suggested activities to read more about this tradition. Read about St. John's Eve particularly in Ireland (note the link is a secular website). From the Germanic countries, here is some information on the Summer Solstice. Etheldreda was the daughter of Anna, King of East Anglia and the sister of Erconwald, Ethelburga, Sexburga and Withburga, all saints. Etheldreda was born in Exining, Suffolk, and was married at an early age to Tonbert, Prince of the Gyrwe, but they agreed to live in perfect chastity. As part of the marriage settlement she received from her husband an estate called Ely. Three years after her marriage, the Prince died, and Etheldreda retired from court and went to live in seclusion on the island of Ely, practicing penance and prayer. For reasons of State she was married again to Egfried, the young son of King Oswiu of Northumbria, who was only 15-years-old. He agreed she should remain a virgin, but 12 years later, demanded his conjugal rights. She refused, saying that she had dedicated herself to God. She asked the advice of St. Wilfrid, Bishop of Northumbria, who supported her claim and told her to go to a convent. With the consent of Egfried, she became a nun at Codingham Convent. Later, she returned to Ely and built a large double monastery there. She was Abbess of the convent for the rest of her life, and died there on June 23, 695. Read this account of the life of St. Ethelreda.